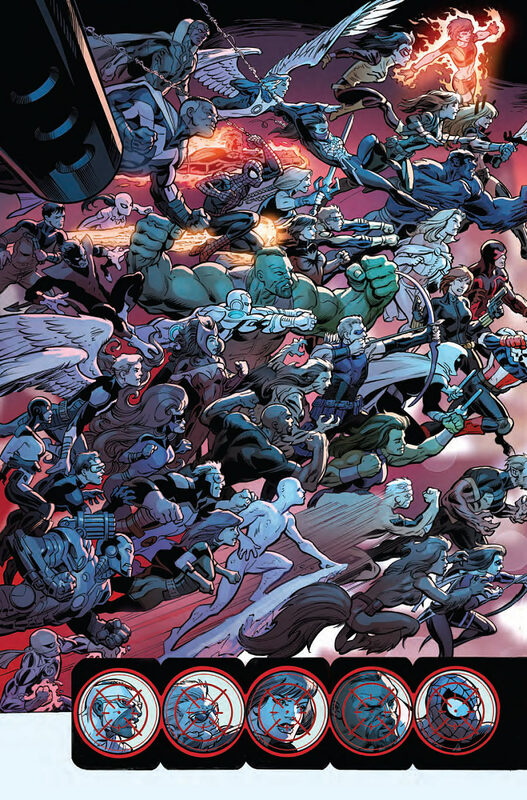 Issue opens with the Punisher preparing to kill every costumed fool in this new Battleworld. Great use of the page break to keep the two worlds’ heroes apart. The left side has Magik and the right side has Ultimate Shadowcat, so this is on! There are a lot more heroes on the left, as there isn’t that many heroes left alive on the right. 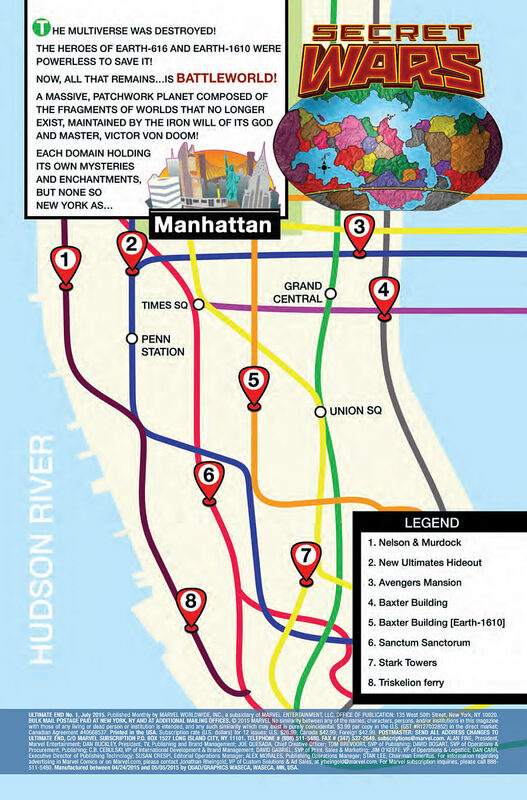 This is our first look at seeing what the Manhattan region looks like, of Battleworld. I do enjoy looking at a fictional map. There are two Baxter Buildings. Bold to not go with 4a & 4b or rather, 4P and 4U. Unfortunately, that two page sequence above is the only reason why I own this issue. Three Weeks Ago. Proper Spider-Man is swinging along. He comes across the Ultimate Serpent Squad. He gets help from the All New Ultimates, minus Shadowcat. Since the image above has her in her all white uniform, I take it that Bendis is back to ignoring the All New Ultimates title written by Fiffe. Bendis used this team of characters a lot in the Miles Morales comic, so he knows them rather well. He typically writes Shadowcat like how Wood did in Ultimate Comics X-Men, when Bendis had a chance to write her in both Catacylsm and the arc where the All New X-Men visited the Ultimate X-Men. Black Widow, the female clone of Ultimate Peter Parker, talks to Spider-Man, who is still very uncomfortable with her existence. There is some vague reference to the miniseries, Spider-Men. The All New Ultimates are insulted that they have not been invited to the big meeting that Spider-Man is going to. The Triskelion. Headquarters and home of the Ultimates, the US-sanctioned superhuman task force create by Nick Fury and SHIELD. So the only ones I have to do the universe tag for will be the Iron Men and Hawkeyes – which is pretty handy. 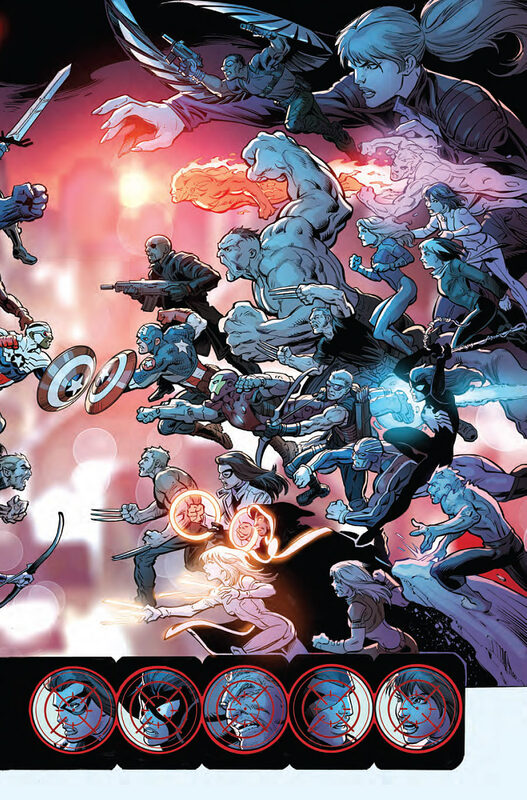 I thought Cyclops was seen in the Proper Life Raft in Secret Wars 2015’s first issue? The same for Spider-Man. The Two Iron Men talk to each other and it is then that I noticed the awesome choice, that I can only imagine should be credited to Petit. The Proper characters speak in all caps and the Ultimate characters speak in proper capitalization. Which is an awesome way to distinction the two universes’ characters. I read somewhere, after I noticed it, that this practice was first used in Spider-Men but I just checked Spider-Men 4 (the only issue of the mini that I own) and Proper Spider-Man is speaking in the Ultimate capitalization so that person got it wrong with that comment. I really do enjoy that decision and glad someone had thought about it. Here, is isn’t that big of a deal, as Proper Tony is in his red and yellow Iron Man suit and Ultimate Tony is both drinking and out of armor. I’m not sure why Proper Tony isn’t in his white Superior Iron Man suit but Emma is back in white, so maybe they all reverted to their last big change. Except Doc Green is in his current look. I’m not sure. Proper Tony is disgusted with Ultimate Tony is drinking alcohol. Spider-Man taps on the window and Fury lets him in. Spider-Man is freaking out as everyone knows his name, as when Ultimate Peter died, they plastered his name all over the newspapers. So the Ultimate heroes know his name and Emma knows his name. He then, mistakenly, says his name – so now everyone knows his name. Proper Tony accuses Ultimate Tony of causing all of this, with his research into the dimensional rift. Which we have seen now in Spider-Men and the Ultimate / All New crossover. I wish that arc had a handy name. I like, that in the flashback, we see the S symbol from that crossover. Scarlet Witch wants to know what Doom has instructed Fury to tell them, I guess Fury is the head of this shared region. Fury wants to find a way to put everything back to the way it was. Spider-Man wonders if there even is anything to go back to. The Proper Heroes are going to keep working on Doc Green’s virtual reality simulation program. The Ultimate heroes are going to keep working on dimensional solutions. Fury stresses that Doom cannot find out about any of this. 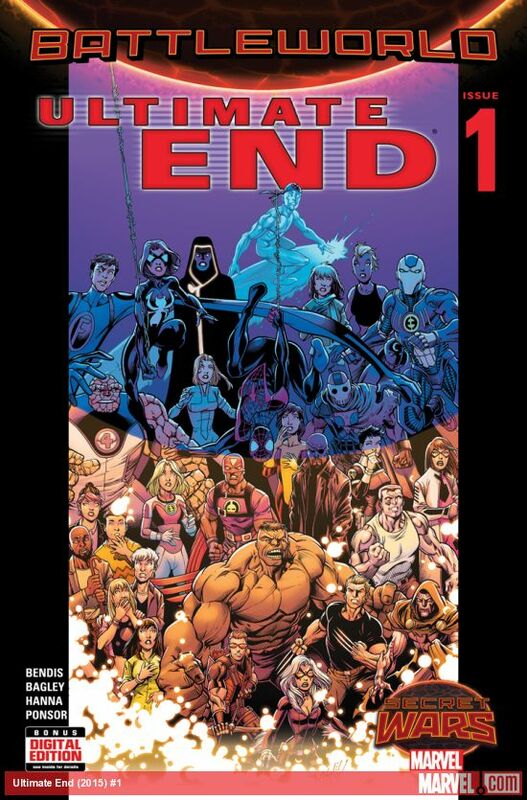 Issue ends with Ultimate Hawkeye telling Fury that Doom has discovered their plans as the final page, the Battleworld Police Force aka The Thor Corp. All of them came out for this, including – Thor Groot (Thoort? ), Throg, Destroyer Thor, Thor Storm, Beta Ray Bill, and two proper looking male Thors. Issue two promises to have the Ultimate Hulk fight Doc Green!